Having your Stripe data into your data warehouse could help you access your raw Stripe payments data and get smart insights, that were not previously there. That is why companies are looking to integrate their Stripe data in their data warehouses like AWS Redshift, Google BigQuery or Microsoft SQL Server. We are excited to introduce our latest integration with Stripe. Stripe is one of the best ways to accept payments online, and it is a robust payments platform. Getting smart business insights and make data-driven business decisions will require you to connect the dots that will span data from your product, marketing, sales or customer service. If you add revenue in the loop then everything “translates” to measurable value. Tracking your revenue is easy. A look at your bank account or in Stripe dashboards can give you an idea. But having access to your raw payment data makes you more flexible on understanding where this revenue comes from and how to optimize it. Getting your raw payment data sure has its value, but where it makes the difference is in combining multiple sources from all business functions. Having all your raw data in one data warehouse means you can be flexible and have clarity over it and get smarter insights. You may get a lot of new users from your recent email marketing campaign, but do they buy your service? If they buy your service, do they create havoc in your customer support department? Or how is your churn affected by ticket resolution time? Another example would be to measure customer lifetime value per channel. Customers come from various touchpoints, and you may calculate the conversion cost and revenue generated. These examples can be all measured by combining data from your customer support tools like Zendesk or Intercom. Email marketing data from tools like MailChimp. Advertisement information from your Facebook Ads or Google Ads and of course your payments tool i.e. Stripe. Your analyst’s job is not integrating and maintaining APIs. Even if it is easy for a dev to help, sometimes getting specific resources as you want them in a data warehouse table proves to be even trickier. With Blendo we give you super powers. Here is a short intro on how to connect Stripe as a source. Using other popular sources like MailChimp, Intercom, Facebook Ads or Zendesk, you can connect marketing spend with support and revenue and superpower your analytics. Combine information from other sources like support and sales. Uncover the funnel of your users that converts better and earns you revenue. Blendo helps teams inside the various functions in a company to connect their analysis with revenue. Previously silo-ed data now they can be accessed without effort in engineering and time resources. Be up and running in minutes. Sync all your information in a data warehouse, connect your BI tool or access the raw data and dive-in. Blendo will take care all the heavy lifting for you; so you can create smarter insights. Today. Check out our documentation for complete information about Stripe integration. Get it now while it’s hot! Try Blendo for 14 days, FREE. 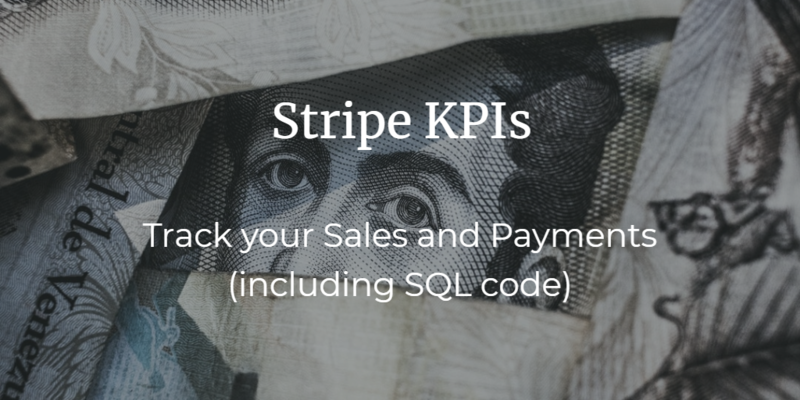 Help your sales and executive team take ownership of the insights of your payments' data that live in Stripe.